Welcome to the Ultramagic balloon simulator! 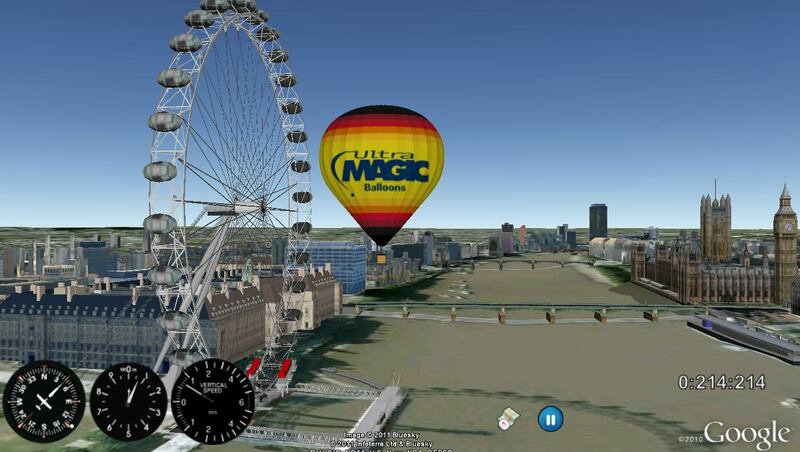 Fly all over the world with Google Earth, design your own scenarios or tasks and compete againts other pilots! You can now share your scenarios with your friends or just everybody! You fly your balloon using the mouse. Move up and down your balloon to follow different wind directions. Your objective is to get as close as possible to the targets and have a safe landing (1m/s). Move the mouse to the corners to change the camera view. Center the mouse to stop the camera movement. Zoom in/out with the mouse wheel or with left or right double click. Hold left button to use the balloon burner. Click the middle button to switch between internal and external view. Hold the middle button to see the map (with Google map controls). Right click to exit the map view. Hold the right button to open the parachute, which makes the balloon loose altitude. A white dot in the directional instrument indicates the heading towards the closest target. There are three in-game icons that show the map, pause the game and multiply the wind speed. If the game freezes just wait some seconds and you will continue at the same point. A fast internet connection and a dedicated graphic card is recommended. Internet explorer is not fully supported. You can contact us at ultramagicsim@gmail.com to give feedback and get support.